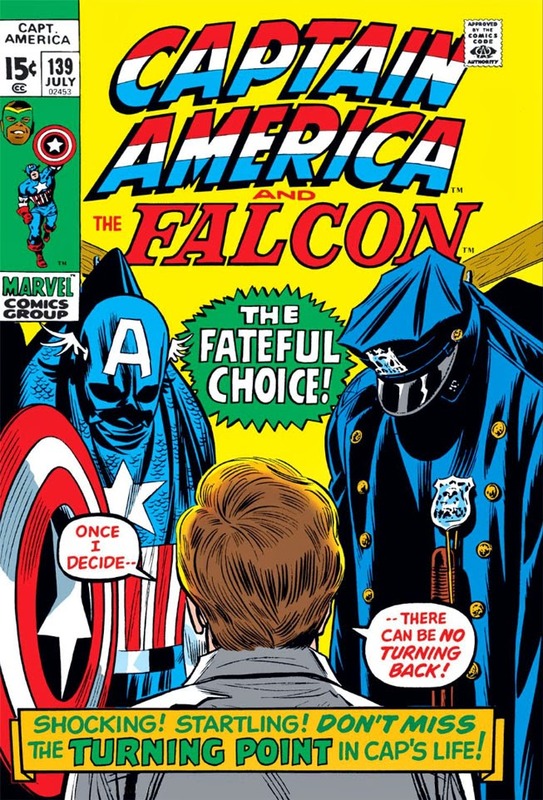 And while Steve Rogers indeed made a choice here, it wasn't so much a choice of vocations as it was a choice to moonlight. 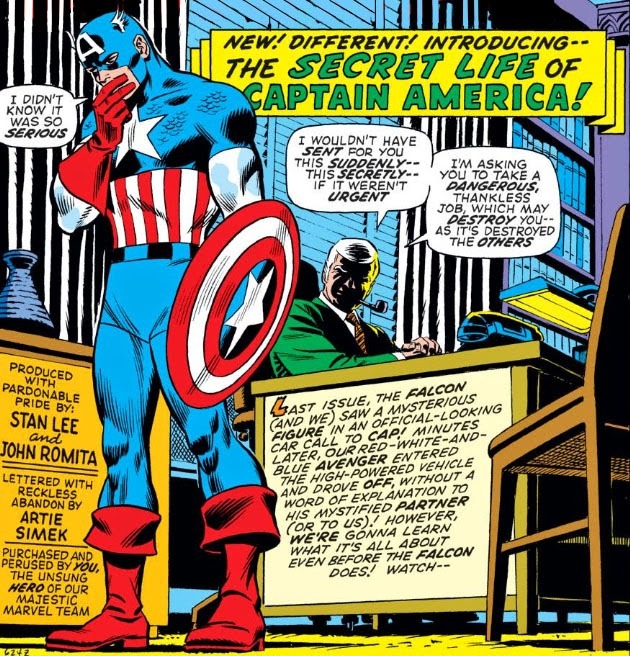 For other heroes who slip out from their normal lives to suit up and fight crime, whether employed or not, that's no big deal in the world of comics--but Cap's situation is unique in that he doesn't yet have a "day job," nor does he have a private life to speak of in this post-war world. 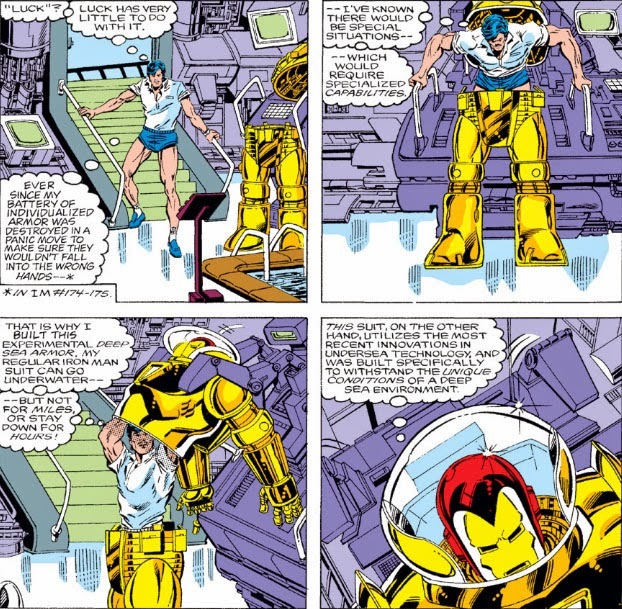 His only other obligations or responsibilities lie with his life as an Avenger, though his association with the team was no substitute for a life of his own. 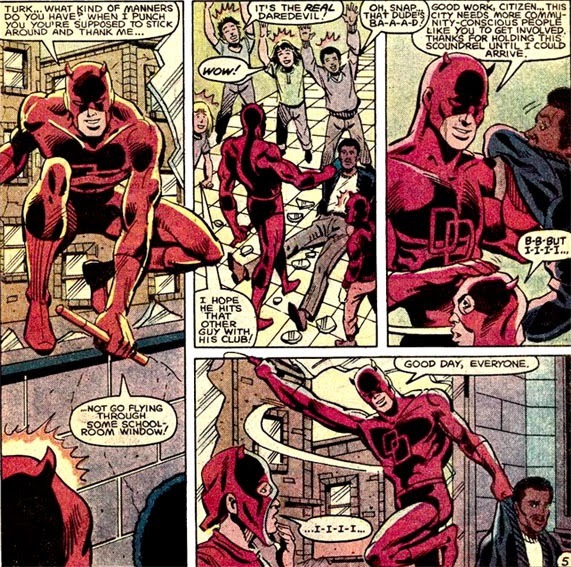 Consequently, an offer to become a police officer meant giving Steve ties to a normal life that he had been deprived of up to this point, as well as being able to relate to and connect with the man on the street in ways that his celebrity status as Captain America couldn't offer him. Not quite a "turning point," as the issue's cover would have us believe--more like a pivot. Death Waits In The Depths! In this case, to recover a canister of death gas that had been developed by an Anglo-American research team prior to World War I. A member of the team had been sent to accompany the canister to America for further testing; unfortunately, that voyage was on the RMS Titanic, and so the canister was sent to the bottom of the ocean floor. 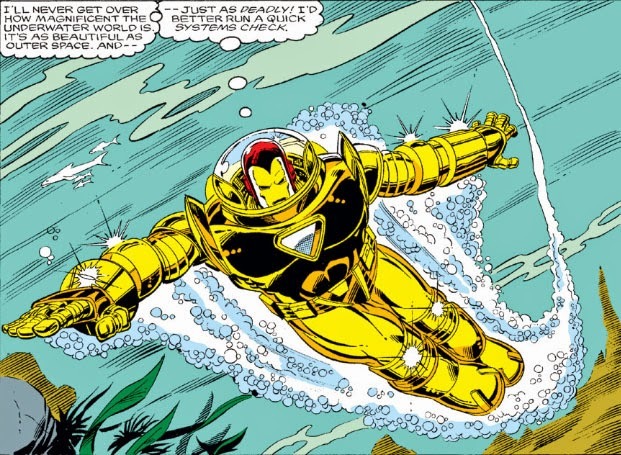 The matter is brought to Stark's attention due to advanced photography equipment he'd developed for the exploration of the wreckage--which not only turned up the canister and enabled authorities to trace its origin, but also discovered that the canister was deteriorating. I even like the golden touch, don't you? 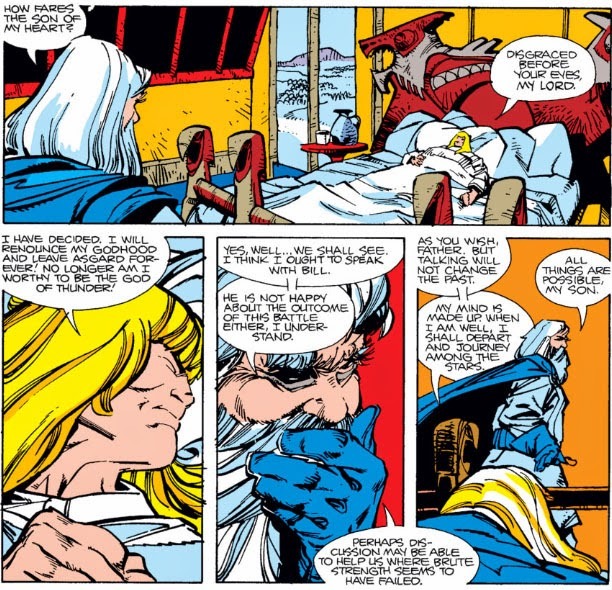 After the apparent death of Odin, the mighty Thor departed the halls of Asgard in order to take his solace in Asgard's northern region, where it was said the cold was such that no living thing could survive. 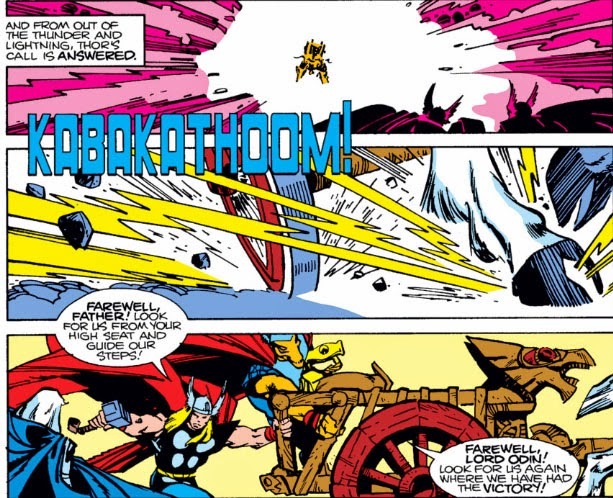 That nearly proved true for Thor as well, when the death goddess Hela caused an avalanche to strike him down. 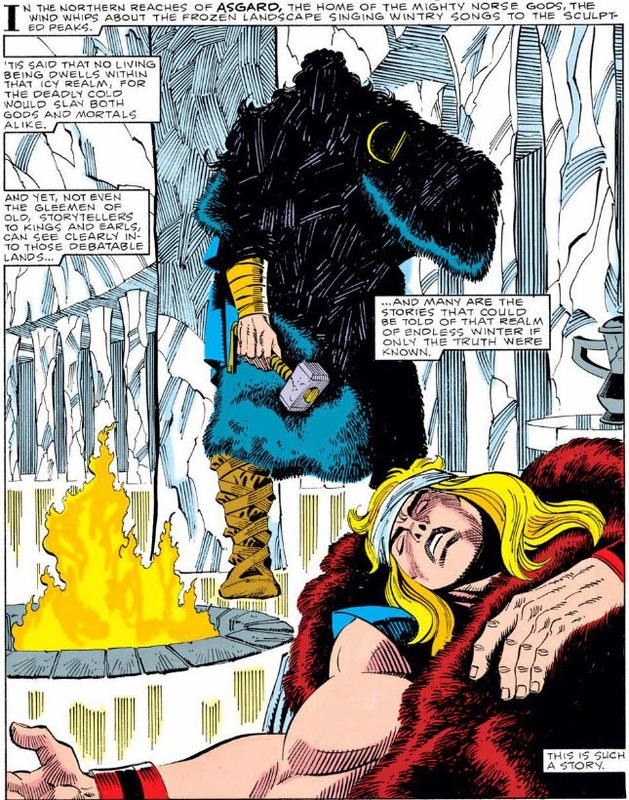 Yet there is indeed a living being in these icy wastes, who finds the unconscious and injured Thor and returns with him to his dwelling--and in a disarming tale by Walt Simonson and Sal Buscema, Thor recovers from both his injuries and his grief in the care of one who is both cloaked in mystery and yet oddly familiar. Also, it's Assistant Editors' Month, so all bets are off as to whether or not this story is going to be on the up and up. 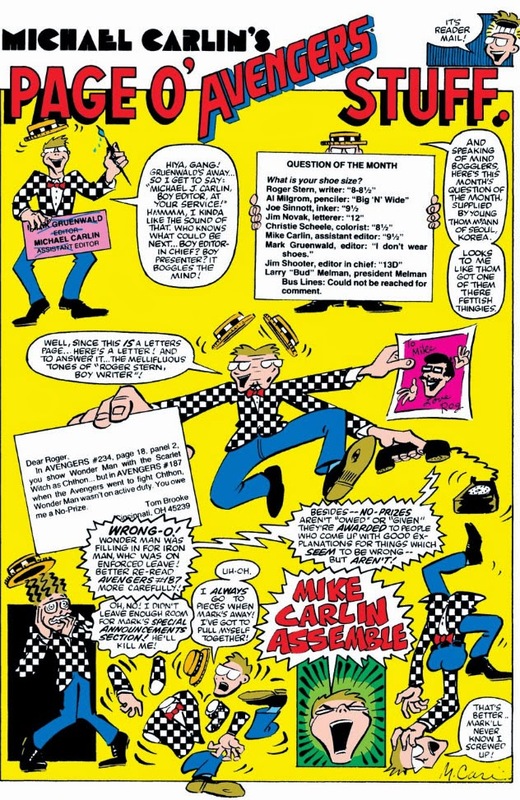 The preposterous absurd insane unlikely team-up that greets our eyes in this issue of Marvel Team-Up declares on its cover, "Not a hoax! Not a What If! Not an imaginary story!" 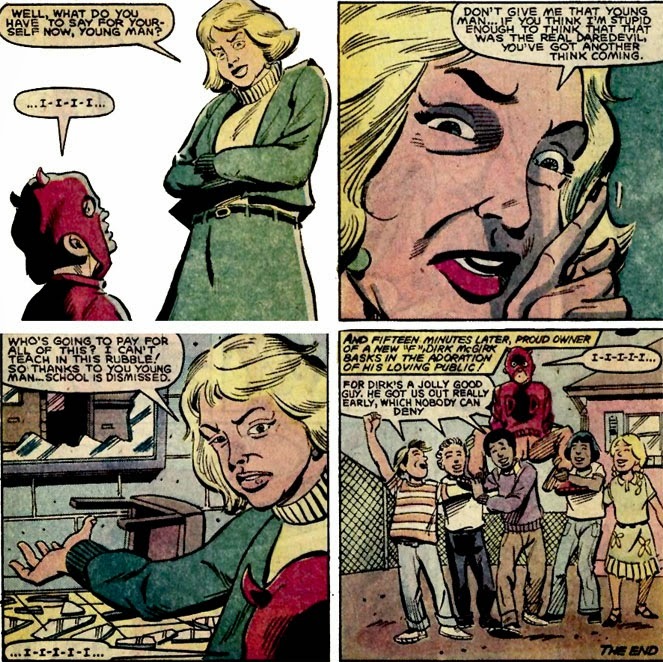 Aunt May should wash out the mouths of the assistant editors with a bar of soap for making those claims. But let's see how bad bad can get, eh? 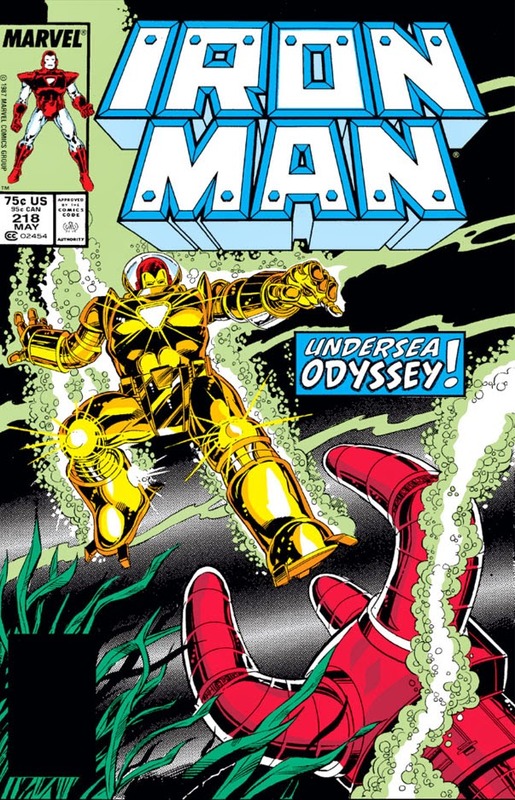 The Coming Of The Man-Thing! 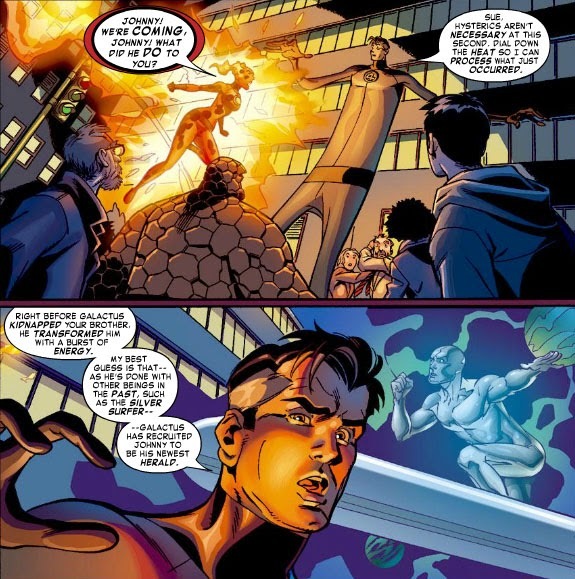 It all began on the fateful day when Ben Grimm, finally free of his existence as the rock-bound Thing, was shown by his former partners to a secret room, where he would discover just who would replace him in the Fantastic Four. Or--was he being replaced? 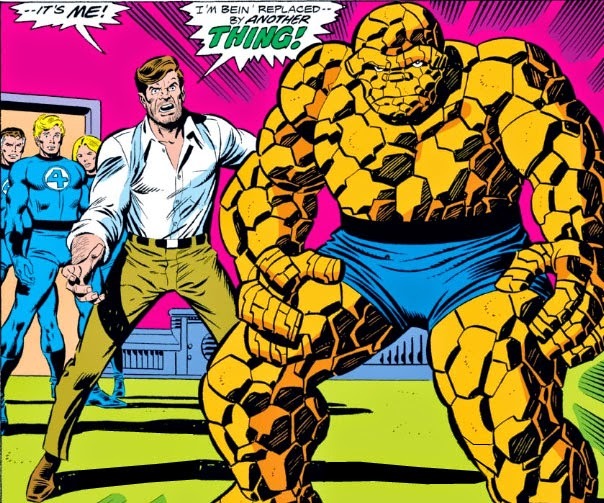 How could Ben Grimm be replaced in the Fantastic Four by--the Thing?? 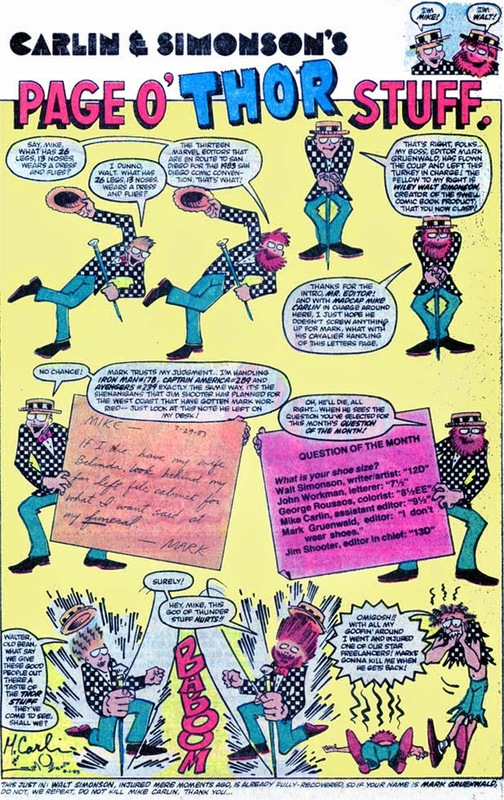 An appearance which should have sent Dirk's grade into the stratosphere. But his teacher is not on board with what she assumes is a surprise arranged by Dirk. On the other hand, Dirk's popularity, unlike his grade point average, soars. 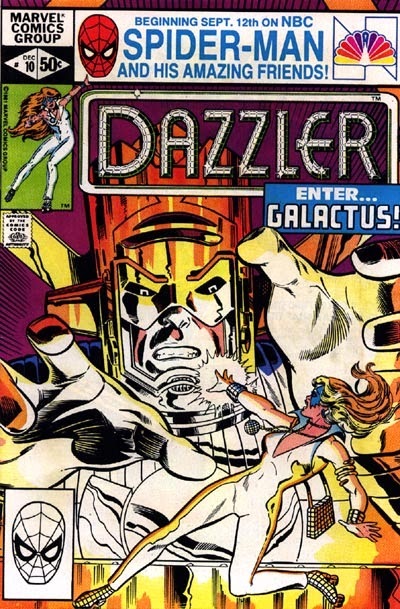 As for the actual Marvel editors, you could see what trouble they're up to in San Diego by picking up Dazzler #30--whose title character is in a little trouble herself, with her book now shifted to bi-monthly publication (though lucky enough to have its publication month coincide with AEM) and having only twelve more issues to go before being cancelled. 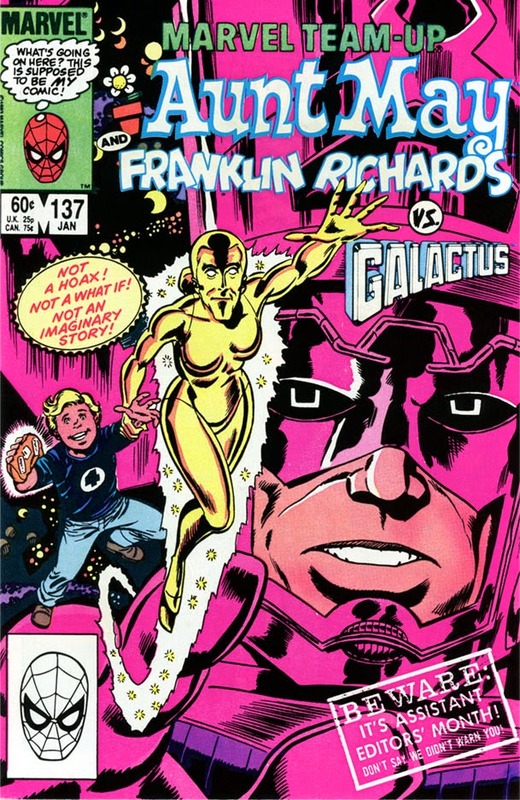 Aunt May, Herald of Galactus! 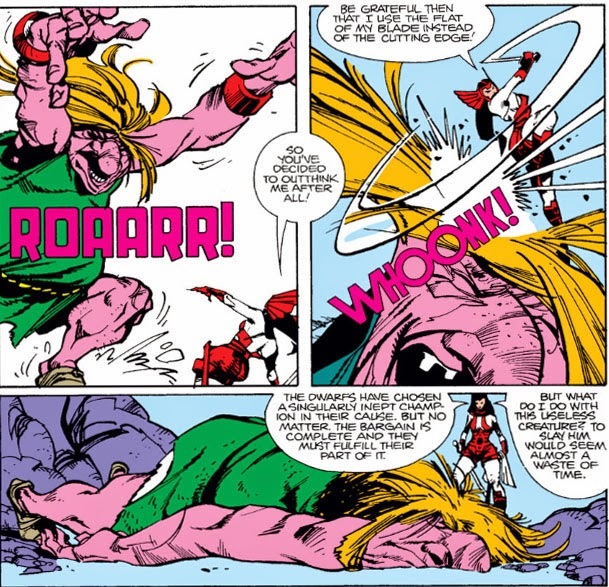 For a story that takes place after a major battle issue, Mighty Thor #339 might surprise you at how much of a page-turner it is. 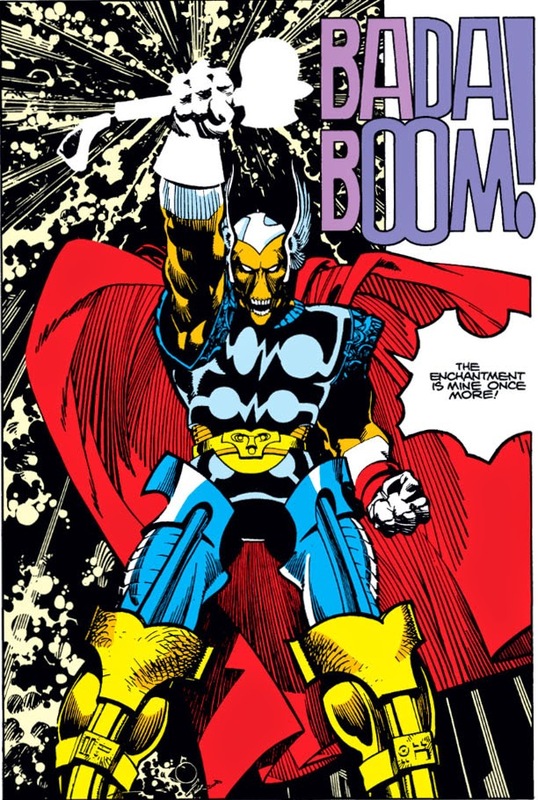 In the story thus far, we've been introduced to Beta Ray Bill, a bio-engineered alien being who has proven able to lift and use Thor's enchanted hammer, and consequently lays claim to it in order to use it to save his race from certain death. 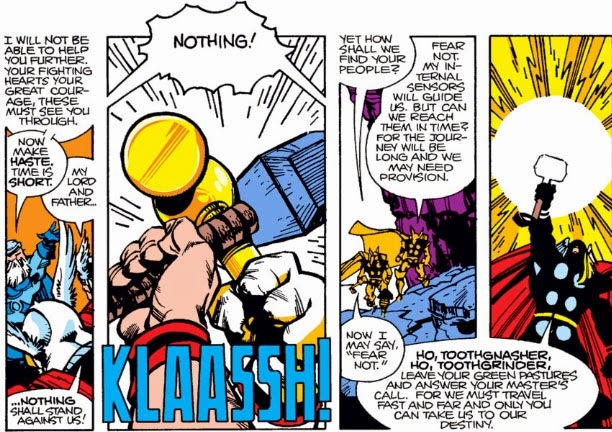 Given that the hammer already has an owner in Thor, Odin then stepped in to arbitrate, and decreed that the hammer would be won in final battle between the two, in the fiery realm of Skartheim. 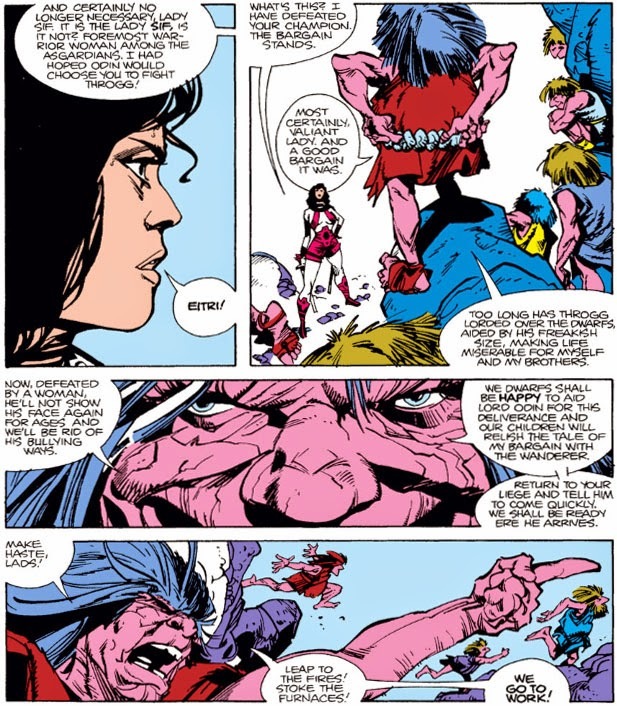 Bill manages to barely defeat Thor, but chooses not to end his opponent's life and instead returns with him to Asgard. 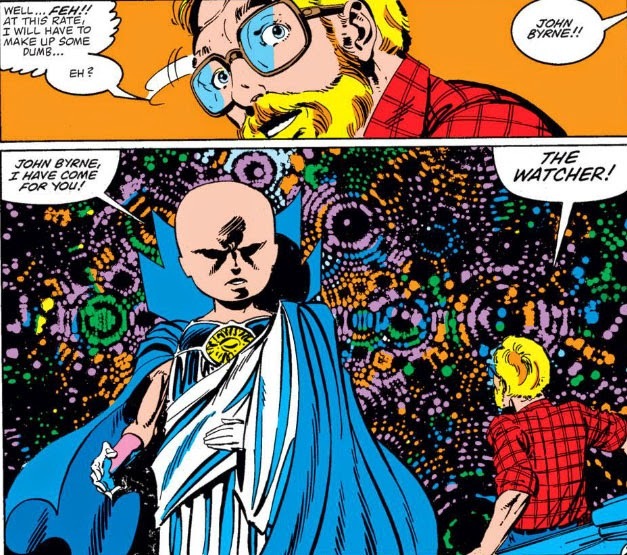 And while the two recuperate, Odin must decide what to do. 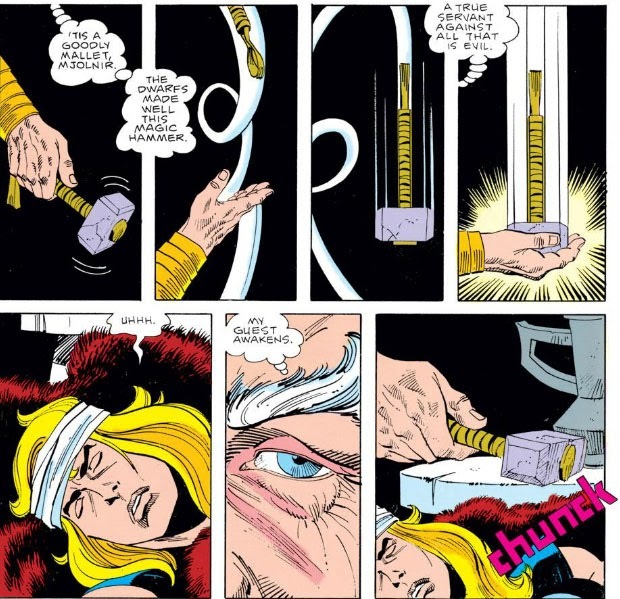 It's an issue that expands on Bill's situation as well as his conscience, rather than his now-settled fight with Thor--and just as Odin must decide on how to proceed from here, Bill and Thor must each come to terms on how they should proceed in the aftermath of their match, a clash which they each find has settled little. 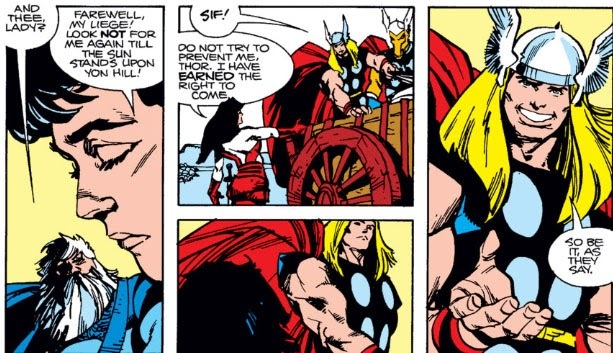 Over the years in reading Thor, we've all seen a number of stories where Odin invokes his wrath, or delivers his judgment on a matter, or rides into battle, or harshly disciplines his son(s), or carries out an elaborate plan that he tells no one of until its culmination--and since it's Thor whose name is on this title, we've generally been content with Odin in these roles. Yet we're nevertheless deprived of a great deal of his potential as a character, as both a father and a leader. 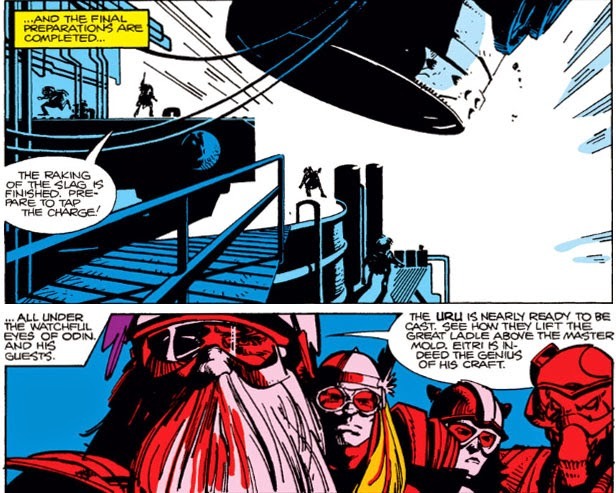 Aside from what's been revealed in Tales of Asgard, we don't see all that much of Odin behind the scenes. 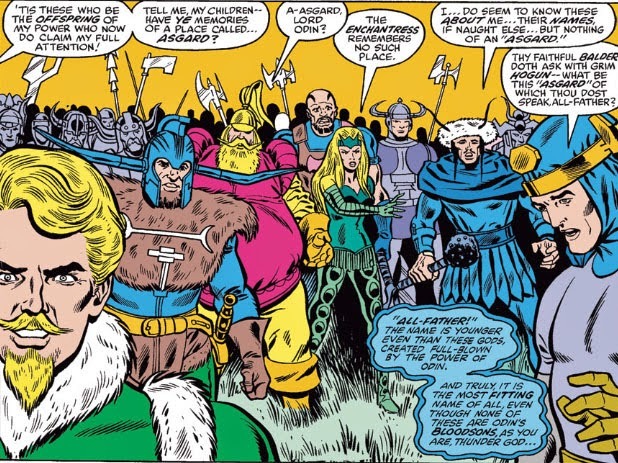 Asgard, after all, is his realm--the Asgardians, his people--and given the fealty the Asgardians show him and the esteem in which they regard him, Odin must not only be a comrade in arms to them, but also accessible and approachable in matters other than battle. 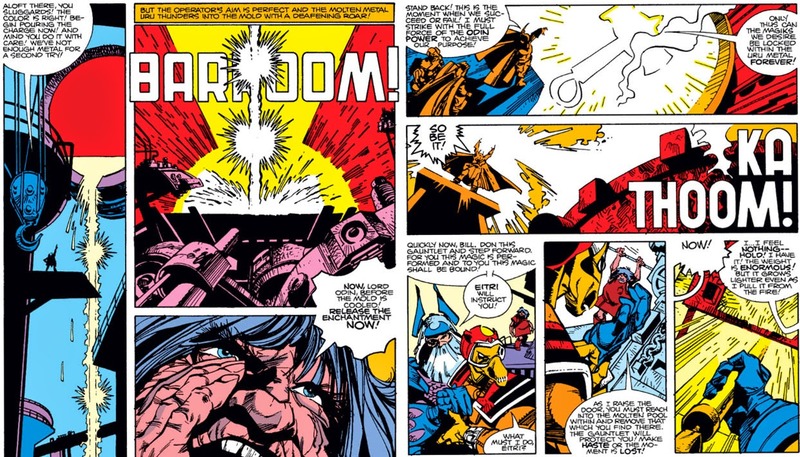 As we'll see evidence of in a minute, writer/artist Walt Simonson, who has just begun his run on Thor with the Beta Ray Bill storyline, appears to subscribe to Thomas's interpretation of the origins of both Odin and Asgard, at least in these early issues. 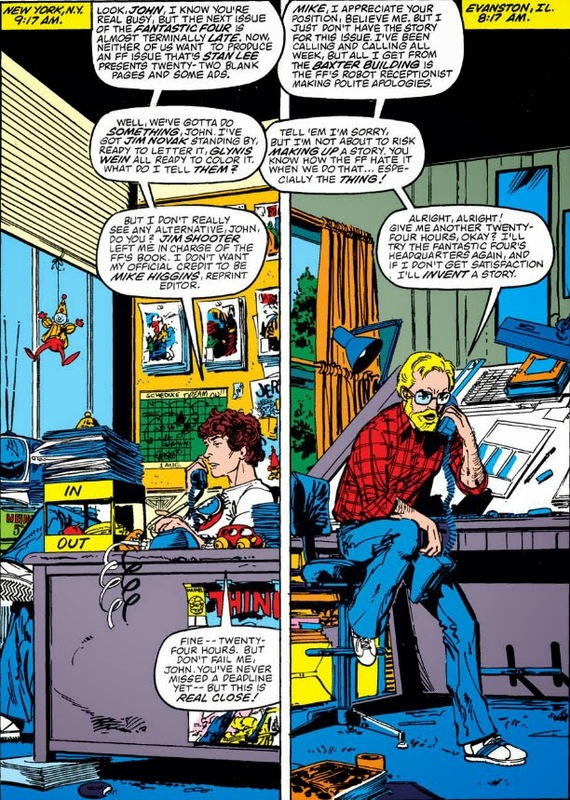 I would prefer it if he did not--because Simonson brings to both of them a sense of character and homeland beyond the obvious traits of pride, glory, and honor that other writers of the title tend to focus on. 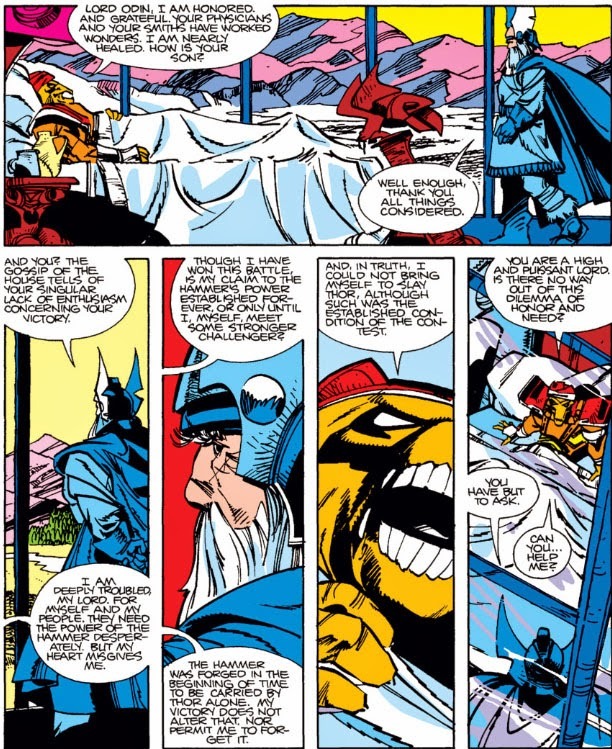 Simonson's Asgardians possess all of these fierce feelings; yet his Odin is possessed of a sense of history and legend that Thomas's god of creation would not identify with beyond shouted oaths and battle cries, while his subjects regard Odin as both ruler and kinsman. 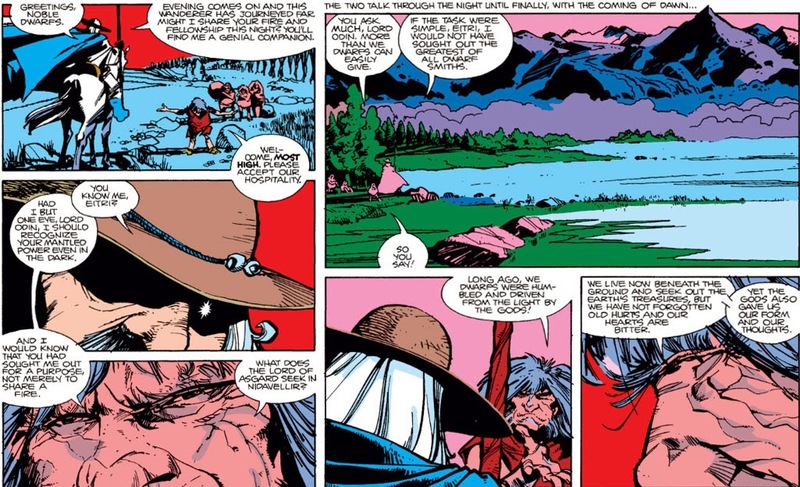 In Eitri's story of ancient wrongs, we get a sense of legend that Thomas's Odin would have acknowledged in a role-playing sense but little more--certainly not as the supplicant that we see here on horseback and without airs. 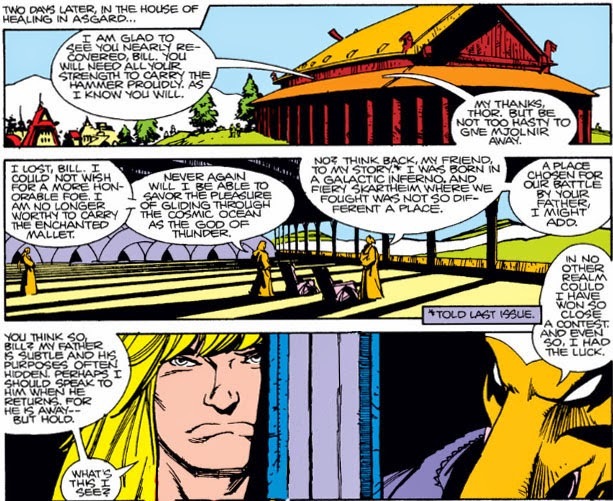 Yet with his words of "the gods gave us our form and our thoughts," we've seen Eitri seemingly fall in line with Thomas's interpretation of Odin's re-creation of this world of the gods--and so, while Simonson strives to give Odin and the Asgardians greater depth, one can't help but wonder how far that can truly go, given that Odin is omniscient as far as Asgard and the beings who populate its lands are concerned. 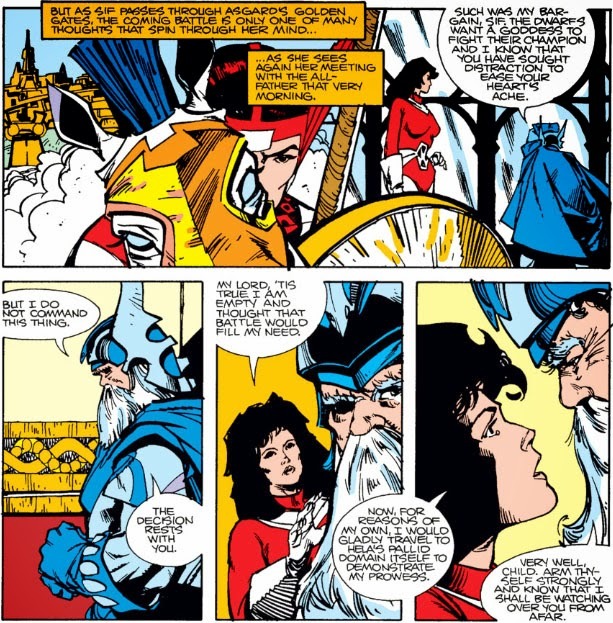 At any rate, his thoughts on Eitri's proposal remain to be seen--but the fact that Eitri converses with Odin on all-but-equal ground speaks volumes as to how much attention Simonson intends to give Asgard and its people in his treatment of Thor. 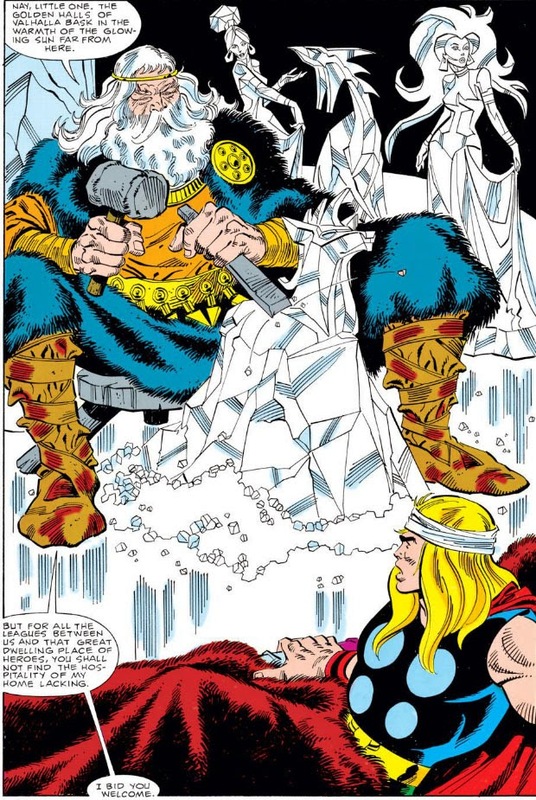 With Eitri's bargain honored, the dwarfs set to the task of fulfilling Odin's plan--making use of the same ancient furnaces that once fashioned the mighty hammer that Thor has long carried into battle. Only this time, the new weapon that's been commissioned will have another master, one who has proven equally worthy to wield it. 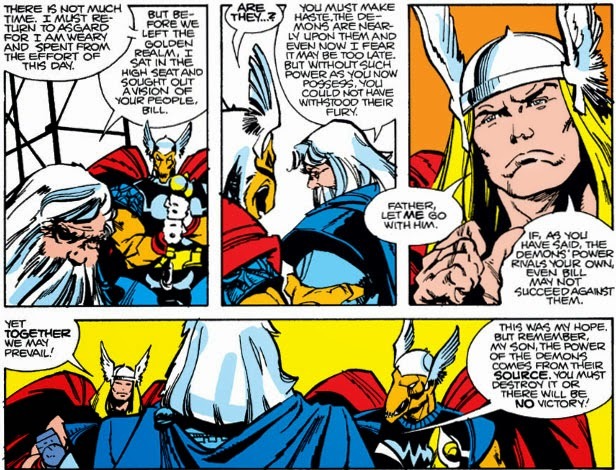 It's a solution that demonstrates Odin's wisdom involving a more subtle matter than deciding battlefield tactics or choosing warriors for a mission. 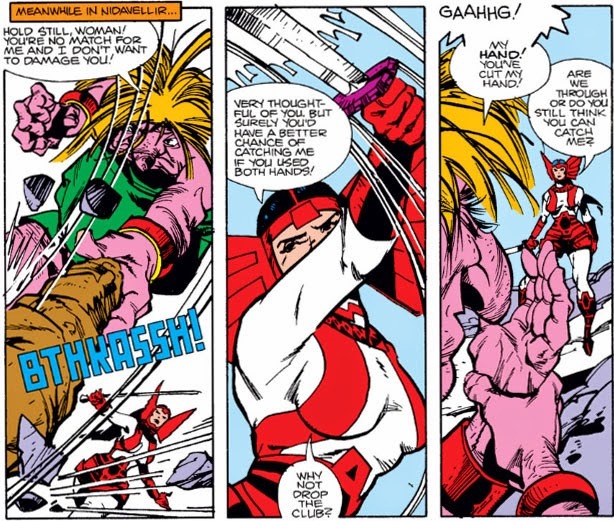 Initially, Odin attempted to handle this problem in the same way that he once had Thor and Loki face off in a "trial of the gods"--by sending Thor and Bill off to duke it out. 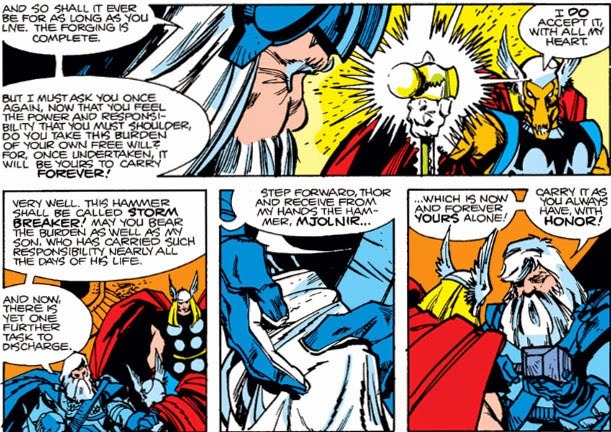 When things turned out to be more complicated, Odin proceeded more carefully, and took the time to be more informed--until finally, the choice of who would lay claim to Mjolnir was rendered moot, and honor was satisfied for both parties. 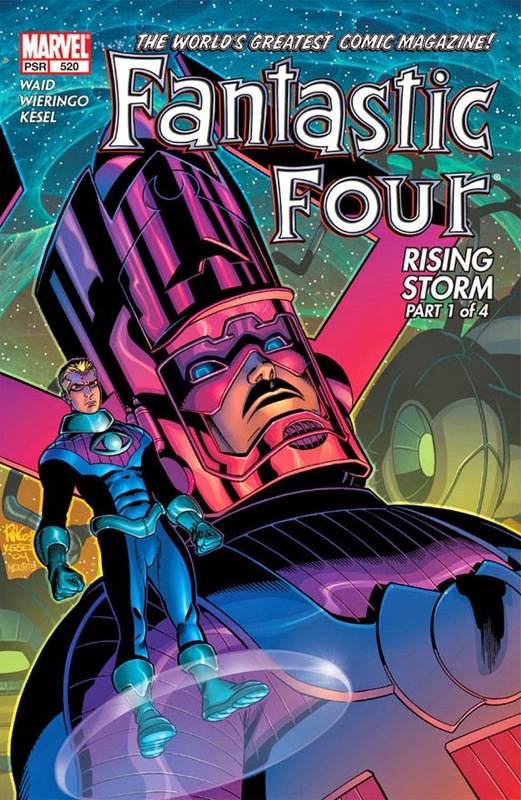 In the process, a new hero has been born--and Thor has a new brother-in-arms. And with the fate of Bill's race hanging in the balance, adventure beckons! 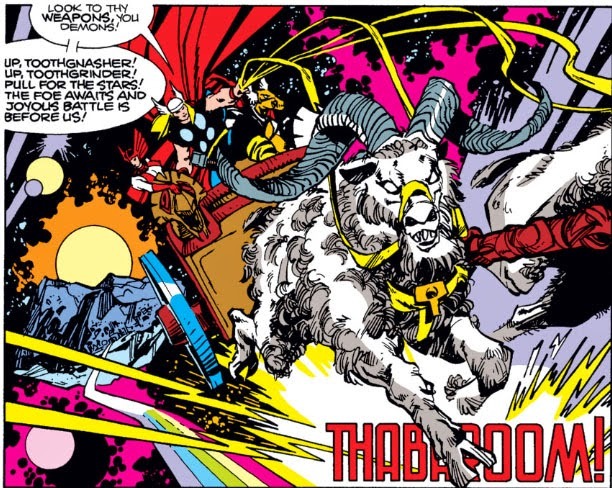 I don't know if the demons who plague Bill's people are going to be impressed at the approach of a wooden chariot drawn by two goats, but I know I'm psyched. Hey, Mikey! You're An Avenger! Dawn Of The Assistant Editors! The Strangest Man Of All Time! 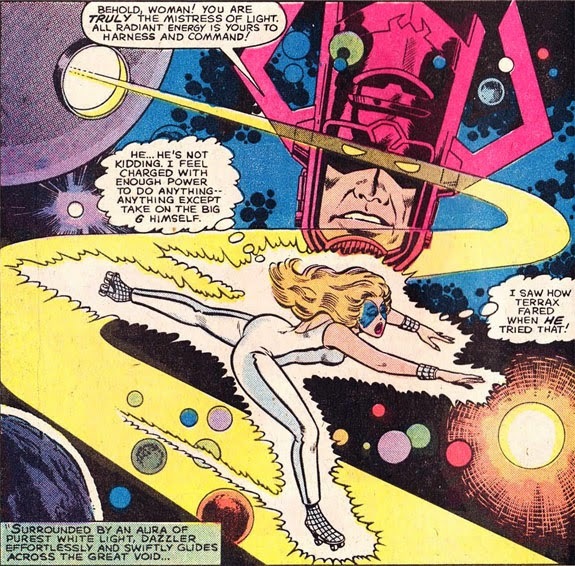 The Invasion of the Super-Skrull! 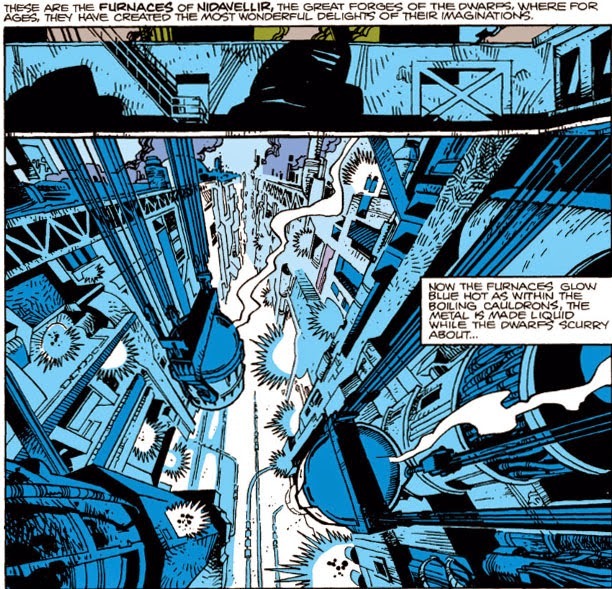 Editor's Picks: Classic Hulk Battles! Legacy of Evil: The Return of the Black Knight!